If there's one thing my students are eager for, it's going up to the board to show what they know. But they love using the interactive whiteboard even more, especially my primary students. Students enjoy the tactile component and being able to manipulate objects on the screen using their hands or the interactive markers. Plus, they are used to using touch screens, which makes the activities more intuitive. And of course, the class becomes very engaged. 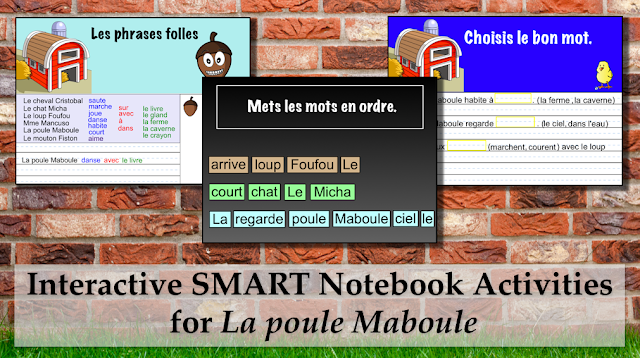 So I decided to make some interactive SMART Notebook activities for my grade 1 classes. The first one is "Les phrases folles" where students create their own silly sentences. I created a bank of colour-coded words: black for subjects/nouns, blue for verbs, purple for "aime" since it doesn't require a preposition, red for prepositions and green for the objects/nouns. I enabled the infinite cloner on each word and locked them in place so all students have to do is drag the words they want to the lines below. Then, using an interactive marker, they can add any necessary punctuation and illustrate their sentence in the space to the right. Variations for older students could include a jumbled word bank to challenge students to find the right parts of speech. They can also write additional vocabulary using the markers. For "Choisis le bon mot", I created separate text boxes for the answer choices and locked them in place but allowed for horizontal movement. 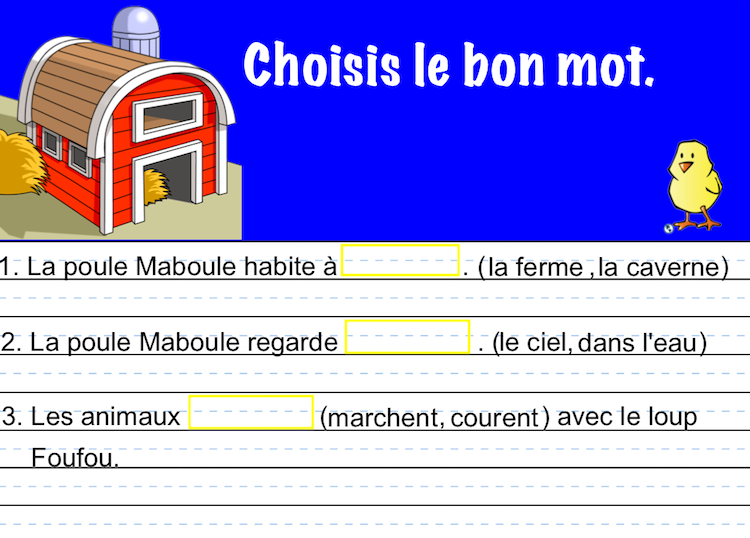 As an alternative, since I added a lined paper background, students can use the interactive marker to write the answers. 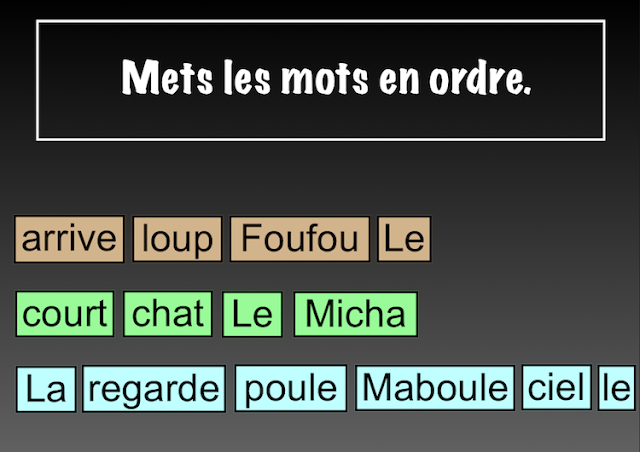 Finally, I created an activity for "Mets les mots en ordre" which, similar to the activity above, uses separate text boxes and are locked in place but can be moved horizontally. I also filled in the text boxes with colour to make them look more like tiles. You may notice that I used the bottom half of the screen for the interactive portion of the activity. This was done intentionally as my primary students cannot reach beyond the middle section of the whiteboard. 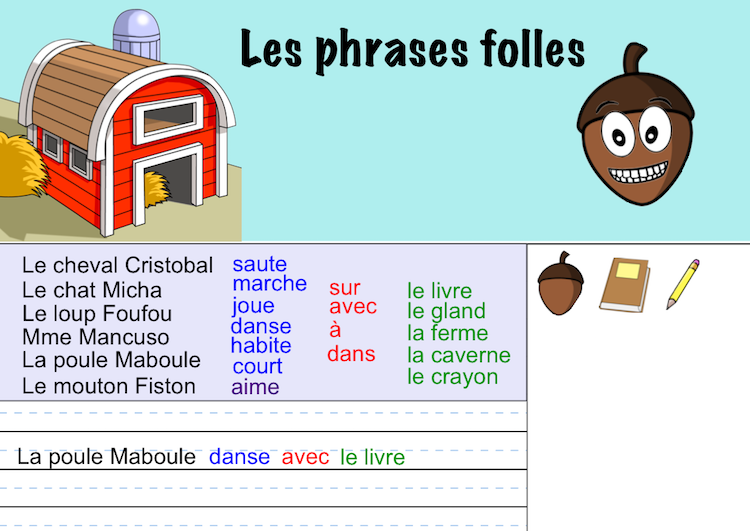 Feel free to download a copy of this Notebook for "La poule Maboule". Keep in mind that you will need to have SMART Notebook installed on your computer to view it. If you do not, you can still use the SMART Notebook Express which has many of the basic features. However, it will likely affect the formatting. This looks like a great learning tool!